They must! 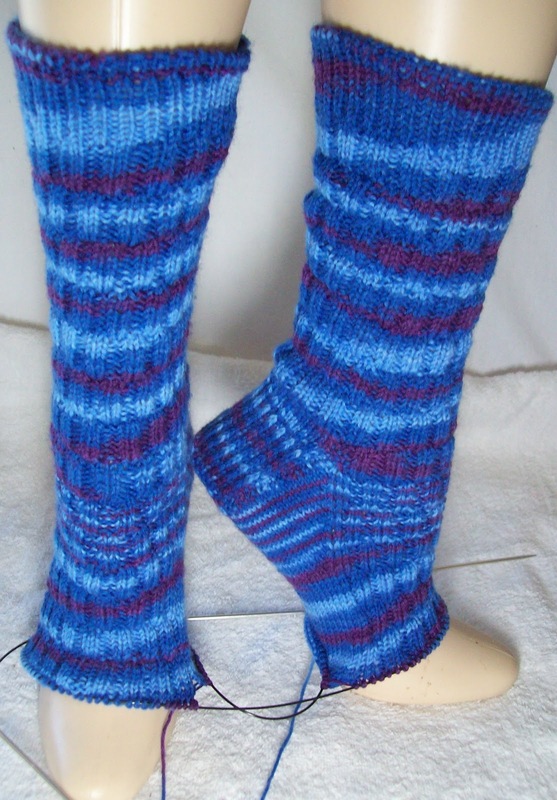 These socks are just so easy to knit, so effortless, they feel like they are knitting themselves. I've had other pairs of sock that seem to take forever, that are full of mistakes, in spite of having been frogged several times, that are just too boring. But not these socks! I mean, this sort of spiral color way isn't really my favorite—I like the colors, but I am not over the top with the way it plays out. The stitch isn't anything special either, -a variation of a 2 X 2 rib. A functional stitch (ribbing is always a functional stitch for an unknown sock yarn!) with just a little change. But look at the progress—not even a week since I started. The gussets were done by Saturday night. As always, once the gusset is done, it seems like the sock is near finished. This sock certainly has a good head start—the flap was long, and the gusset longer. By the time it was finished, over 3 inches of the sole had been knit. I added almost another 3 inches yesterday (6 inches of the foot now done!). There is not much more (inch, inch and half) to do before I start the toe! I would have gotten more done, but... I SInned, this weekend. A very venial sin, hardly a SIn at all—needles and notions, (but I do have plans to buy yarn!) In case you don't know SIn is Stash Increasing. If you are local to NY/LI area, let me tell you about a wonderful sale. Stephen—inherited an yarn store. He was unable to keep it running. So it closed. He put all the yarn into storage (temporarily) and is now selling it off. (He has been doing this intermittently for a while) You can contact him here: frangoss-AT-katewwdb-DOT-com—Put yarn sale in the subject, and tell him I sent you—and he'll send you an email with a spread sheet and details of what his has for sale, (and prices) and other details (address and directions)--fore armed with the information of what is available, (and how much it cost) you can decide for yourself if it is worth the drive to LI's north shore. It was for me. Most of the stock (yarns/needles/books) are a few years old. But it's all been stored well, and looks brand new. There are discontinued yarns (Lion Brand Magic Stripes say) but if you like the yarn, it won't matter; and if you like Paton Classic Wool Merino (also now, sadly discontinued) it is actually a good thing! Some yarns/colors he has a single skein-some 30+ skeins. But its all very neatly organized, not all a jumble. I went to his sale last year,and was convince I got the best to be had (several MILES lovely lace weight wool, and some sock yarn) but I WAS WRONG! He had sale again on Saturday (past), and will have more stuff on sale next Saturday, March 10th. Needles, notions, and books and yarn! All at great prices. I bought myself a set of sock needles--size 1's, (that is, a pair of circ's) --and I bought an other pair for a friend(size 2's) –both sets of Susan Bates circulars, for $2 each. And then, because so many have been generous to me over the years, I also bought some tape measures (to give a way) and paired them with some stitch markers (from last years sale) for friends, (I also bought some scissors for me). It was a bit of a party at Panera's yesterday. I hardly spent anything (many of the notions were just $0.50!) --and I had a blast. Nancy, Jessica and Debbie were happy—all of them are newish knitters and are still building up their kits of knitting notions. Next weekend, I'll be back along with the aforementioned Nancy, Jessica and Debbie, for sock yarn. There is a ton to be had. I especially want some of the wonderful colors of Kroy solids--many of these solid colors have been discontinued. I have lots of patterned sock yarn, some bright clear solid colors will be a nice addition. Will I see you there? By then, I hope to have both the blue socks and the secret socks done! Hell, hopefully the violet blue blend socks will be done by tomorrow! I'd never heard of "SIn" before. I like it! Your socks are coming along beautifully, and I wish I was local because that sale sounds great! I'm sick of the ones I'm making and of course in this case it's me at fault. Da brain. I will start another pair asap that are just plain knit or something close.